This Tex-Mex Restaurant & Lounge traveled from the Mid-West to bring you their family tradition of Tex-Mex flavors. A little history here, “The Grasshopper Lounge” opened its doors in 1971 by owners Jesse and Cleo Rosales in the historical 1873 US Armory building of downtown Adrian, Michigan. Thereafter in 1978, the family acquired the other half of the structure and “El Chapulin Tex-Mex Restaurant” was launched. 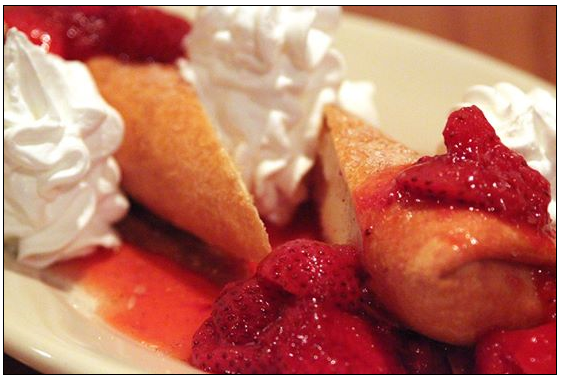 Still in business and operated by the entire family, they have since opened a second location in Wauseon, Ohio. Then in 2013 in beautiful Sarasota, they opened their third location, The Grasshopper-El Chapulin, where Dino Soto’s passion to please his customers shows in every dish. So as you can see, this family is going full speed ahead and isn’t stopping any time soon. 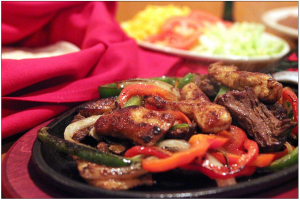 Speaking of their family’s traditional Tex-Mex flavors, whether they are starters, appetizers or entrees you’ve ordered, the awesome spices in their dishes will get you off your seat to dance a little Jarabe Tapatio. But first put your Margarita down so not to spill one delicious drop. And know that when you are reading the menu, the owner/chef Dino sees those items he prepares from scratch, like an artist sees a blank canvas…ready to create a work of art. And that includes the wonderful desserts. There are lunch and dinner specials daily. And Dino loves that you may come in regularly for your favorite familiar meal, but then he says, it’s time to take an adventure across his menu. Go on a journey and try something different, and guaranteed, you’ll find your list of favorites growing each week. Yes, this is definitely an enthusiastic environment that says celebrate life. But no need to wait for the weekend. 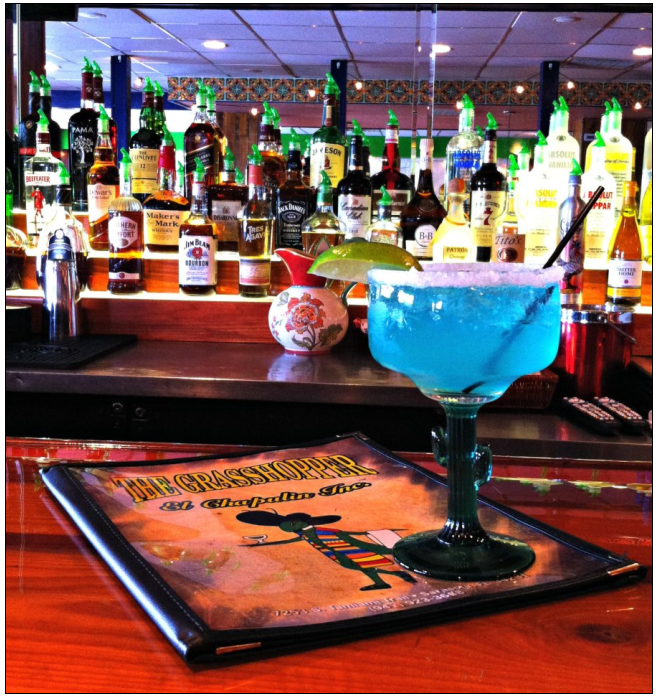 You can start celebrating right at the beginning of your week with their Margarita Mondays, $3.00~ALL DAY. 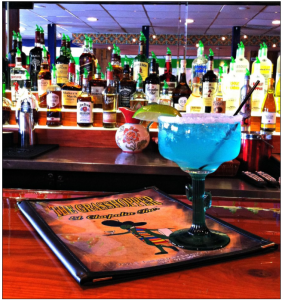 Then you have plenty of time to stay happy with their Fiesta Hour, 4:00-7:00 p.m. ~ Daily. 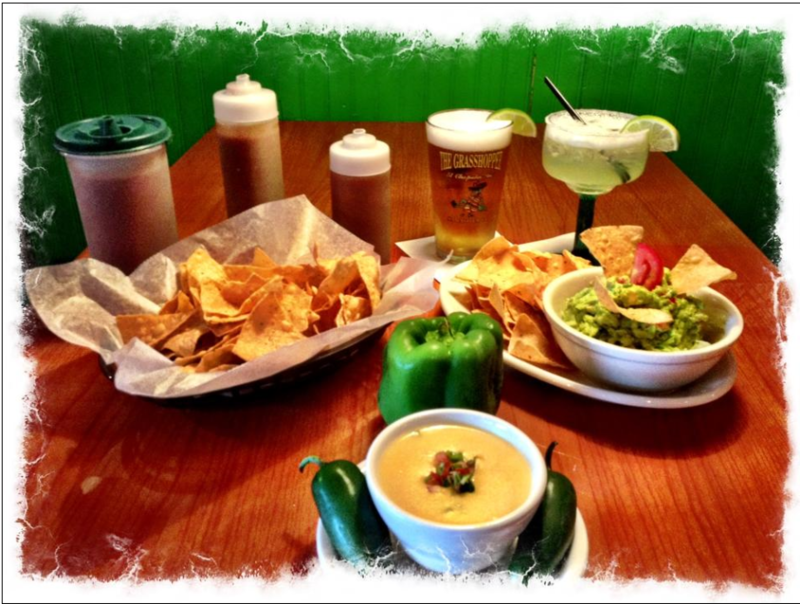 Be sure to include their signature Green Sauce made with yellow queso, jalapeños and green bell peppers, with their homemade guacamole, and tostada chips which are prepared daily with no preservatives. Perhaps even order some to go to have your own Fiesta on our beautiful Siesta Key beach the following day. Everyone deserves a little Fiesta time. And Beth has certainly ended her search. She says, “The absolute best there is. We have sampled Mexican food from coast-to-coast and north to south. 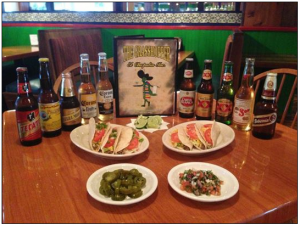 We’ve never found food so appetizing, fresh and authentic as what is served at The Grasshopper. Nothing beats The Grasshopper…FL, MI and OH.” They make it very clear that this restaurant can be the top choice for your local stopping ground. It’s that friendly type of a place where everyone knows your name. Getting back to celebrating life, “Whether you prefer a classic margarita on the rocks or frozen, it’s the most common tequila based cocktail in the United States today.” Hence, National Margarita Day was born, which is every year on Feb. 22nd. It was started to “celebrate the margarita, plain and simple. 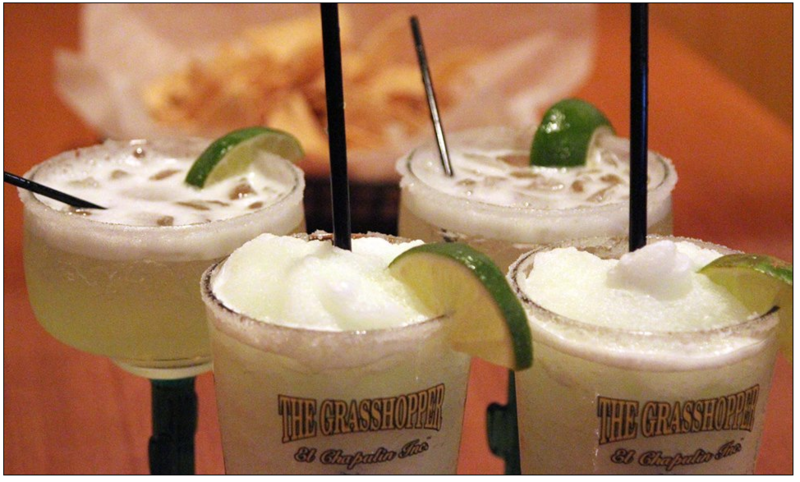 Friendship, good times and memories of somewhere warmer are all great reasons to enjoy a margarita.” However, since you’re in paradise Sarasota where the sun is always shining, no need to think of memories of warmer weather, but to make more of them, at The Grasshopper-El Chapulin. Feel free to bring a group of friends to finish off a Fiesta hour by extending it into the evening with perhaps starting a “Friends are Forever Margarita party”. After all, toasting to life has no curfew. Their hours are: Monday-Thursday 11:00 a.m.-11:00 p.m., Friday & Saturday 11 a.m.-12 a.m., Sunday: 4:00 p.m.-9:00 p.m.
Their location is: 7253 South Tamiami Trail, Sarasota, FL. Be sure to stay updated by liking their Facebook page: https://www.facebook.com/TheGrasshopperElChapulin. Call for reservations, takeout or catering: (941) 923-3688. Walk-ins are welcomed. Always know that when you’re on your way over, even if it’s raining, the sun will always be shining when you walk through the doors of The Grasshopper…El Chapulin, that is.